X It raises its tail to check its surroundings. The tail is sometimes struck by lightning in this pose. X Es streckt seinen Schweif nach oben, um seine Umgebung zu prüfen. Häufig fährt ein Blitz hinein. X Il élève sa queue pour surveiller les environs. Elle attire souvent la foudre dans cette position. X Levanta su cola para vigilar los alrededores. A veces, puede ser alcanzado por un rayo en esa pose. X Solleva la coda per esaminare l’ambiente circostante. A volte la coda è colpita da un fulmine quando è in questa posizione. X 꼬리를 세우고 주변의 상황을 살피다 보면 가끔 꼬리에 번개가 친다. Y It has small electric sacs on both its cheeks. If threatened, it looses electric charges from the sacs. Y Es hat kleine Backentaschen, die mit Elektrizität gefüllt sind. Bei Gefahr entlädt es sie. Y Pikachu a de petites poches pleines d’électricité sur ses joues. S’il se sent menacé, il laisse s’échapper des décharges électriques. Y Las bolsas de las mejillas están llenas de electricidad, que libera cuando se siente amenazado. Y Se spaventato, perde scariche elettriche dalle due sacche che ha sulle guance. Y 뺨의 양쪽에 작은 전기 주머니가 있다. 위기 상황일 때 방전한다. Omega Ruby This Pokémon has electricity-storing pouches on its cheeks. These appear to become electrically charged during the night while Pikachu sleeps. It occasionally discharges electricity when it is dozy after waking up. Omega Ruby Dieses Pokémon kann in seinen Backentaschen Elektrizität speichern. Diese laden sich nachts auf, während Pikachu schläft. Es entlädt manchmal seine elektrische Ladung, wenn es gerade aufgewacht und noch schläfrig ist. Omega Ruby Ce Pokémon dispose de petites poches dans les joues pour stocker de l’électricité. Elles semblent se charger pendant que Pikachu dort. Il libère parfois un peu d’électricité lorsqu’il n’est pas encore bien réveillé. Omega Ruby Este Pokémon tiene unas bolsas en las mejillas donde almacena electricidad. Parece ser que se recargan por la noche, mientras Pikachu duerme. A veces, cuando se acaba de despertar y está aún medio dormido, descarga un poco. 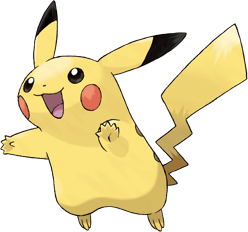 Omega Ruby Pikachu immagazzina l’elettricità nelle guance. Pare che queste si ricarichino durante la notte quando dorme. Talvolta emette delle scariche elettriche al risveglio mentre è ancora assonnato. Omega Ruby 뺨의 전기 주머니에 있는 전기는 한밤중 자는 동안 축적되는 것 같다. 잠이 덜 깨서 방전하기도 한다. Alpha Sapphire Whenever Pikachu comes across something new, it blasts it with a jolt of electricity. If you come across a blackened berry, it’s evidence that this Pokémon mistook the intensity of its charge. Alpha Sapphire Immer wenn Pikachu auf etwas Neues stößt, jagt es einen Elektroschock hindurch. Wenn du eine verkohlte Beere findest, hat dieses Pokémon seine elektrische Ladung falsch eingeschätzt. Alpha Sapphire Chaque fois que Pikachu découvre quelque chose de nouveau, il envoie un arc électrique. Lorsqu’on tombe sur une Baie carbonisée, ça signifie sans doute qu’un de ces Pokémon a envoyé une charge trop forte. Alpha Sapphire Cada vez que un Pikachu se encuentra con algo nuevo, le lanza una descarga eléctrica. Cuando se ve alguna baya chamuscada, es muy probable que sea obra de un Pikachu, ya que a veces no controlan la intensidad de la descarga. Alpha Sapphire Quando Pikachu incontra qualcosa che non conosce, lo colpisce con una scarica elettrica. Quando si vede una bacca annerita, è evidente che questo Pokémon ha emesso una scossa troppo forte. Alpha Sapphire 처음 보는 것에게는 전격을 맞춘다. 새까맣게 탄 나무열매가 떨어져 있다는 것은 전격의 세기를 조절하지 못했다는 증거다. 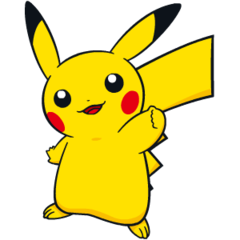 Sun A plan was recently announced to gather many Pikachu and make an electric power plant. Moon It’s in its nature to store electricity. It feels stressed now and then if it’s unable to fully discharge the electricity. Red When several of these Pokemon gather, their electricity could build and cause lightning storms. Blue When several of these Pokemon gather, their electricity could build and cause lightning storms. Yellow It keeps its tail raised to monitor its surroundings. If you yank its tail, it will try to bite you. Stadium Lives in forests away from people. It stores electricity in its cheeks for zapping an enemy if it is attacked. Gold This intelligent Pokemon roasts hard berries with electricity to make them tender enough to eat. Silver It raises its tail to check its surroundings. The tail is sometimes struck by lightning in this pose. Crystal When it is angered, it immediately discharges the energy stored in the pouches in its cheeks. Stadium2 This intelligent Pokémon roasts hard Berries with electricity to make them tender enough to eat. Ruby Whenever a Pikachu comes across something new, it blasts it with a jolt of electricity. If you come across a blackened berry, it's evidence that this Pokemon mistook the intensity of its charge. Sapphire This POKeMON has electricity-storing pouches on its cheeks. These appear to become electrically charged during the night while PIKACHU sleeps. It occasionally discharges electricity when it is dozy after waking up. Emerald It stores electricity in the electric sacs on its cheeks. When it releases pent-up energy in a burst, the electric power is equal to a lightning bolt. Pearl If it loses crackling power from the electric pouches on its cheeks, it is being wary. Platinum It occasionally uses an electric shock to recharge a fellow PIKACHU that is in a weakened state. HeartGold This intelligent Pokémon roasts hard berries with electricity to make them tender enough to eat. Black It occasionally uses an electric shock to recharge a fellow Pikachu that is in a weakened state. White It occasionally uses an electric shock to recharge a fellow Pikachu that is in a weakened state. White 2 It occasionally uses an electric shock to recharge a fellow Pikachu that is in a weakened state.